Brake Hose & Component Supplies (Pty) Ltd.
Partinform is an association under the auspices of the Automotive Aftermarket Manufacturers Association (AAMA). 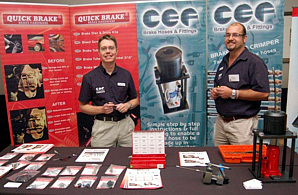 Partinform consists of 17 quality component manufacturers that host seven trade shows around South Africa annually. The Partinform Trade Shows are aimed at the motor trade - motor technicians, tyre fitment outlets, franchised dealers and retail spares outlets. This is an opportunity for the people using and fitting the parts to talk to the people who manufacture or distribute them. The manufacturers always have experienced technical people manning their booths so it is a great opportunity to advise customers on what future technologies and range expansions are on the way. These are always important evenings for Brake Hose and Component Supplies (Pty) Ltd. (BHCS) as we promote our manufacturing distributors and our stockists to the local motor trade.